The Program will run from 10:00am-12:00noon, registration begins at 9:30. An educational program of the Integrated Field Crop, Soil, and Pest Management Program Work Team in conjunction with Cornell Cooperative Extension with support from the Cornell University Agricultural Experiment Station will be hosting the Small Grains Management Field Day with research demonstrations and presentations of interest to the local farming community. Click here for more information, including field day agenda and available DEC recertification credits and CCA CEU’s. All are welcome to attend, no fee! Let us know if you plan to attend (mem40@cornell.edu). For more information, please contact Mary McKellar at mem40@cornell.edu or 255-2177 or Gary Bergstrom at gcb3@cornell.edu. Winter wheat in New York is generally a week or more past the initiation of flowering, and fungicide application should no longer be considered. Some fields may be harvested within 30 days, the harvest restriction interval for triazole fungicides. According to the FHB Risk Tool, the risk of FHB resulting from infection at flowering in May was low across the state. The first leaf rust of the season was observed this week in Orleans Co. Powdery mildew and fungal leaf blotches are present but generally at low levels. Several fields in the western counties along Lake Ontario had armyworm above threshold levels and were sprayed with insecticide. Overall, the New York winter wheat crop looks excellent. Last week temperatures ranged from 9 to 12 degrees above normal for most of the state. Areas of Oswego, Onondaga, and Cayuga counties were over 12 degrees above normal, while areas in the St Lawrence Valley were 6 to 9 degrees above normal. Precipitation amounts ranged from just a trace to an inch for most of the state, isolated areas had up to 2 inches due to storms earlier in the week. The base 50 growing degree-days ranged from 100 to 150. Today will be sunny with temperatures closer to normal. Western NY will see mid 60’s, increasing across the state to upper 70’s along the Hudson Valley. Overnight temperatures will be in the mid to upper 40’s. Friday will be mostly cloudy and rainy with highs in the 70’s. A low-pressure system will move across the state on Friday and into the evening brining showers, heavy at times and thunderstorms are possible. Precip totals are expected to be 1-1 1/2 inches. Lows will be in the 50’s. Saturday will be cloudy with showers possible throughout the day and highs in the mid to upper 60’s. Lows will be in the upper 40’s and low 50’s. Sunday will cloudy with possible showers throughout the day but peaking in the afternoon, highs will be in the upper 60’s and low 70’s. Overnight temperatures will be in the low 50’s. Monday will be partly sunny with a chance for showers and temperatures in the 70’s. Lows will be in the mid to upper 50’s. Tuesday’s temperatures will be in the upper 60’s and low 70’s with partly sunny skies. Lows will be in the 50’s. Wednesday will be in the mid 60’s to low 70’s with overnight temperatures in the low to mid 50’s. The five-day precipitation amounts will range from 1.5 to over 2 inches. The 8-14 day out look is showing above normal temperatures for all but the lower Hudson Valley and normal precipitation for most of the state (Chautauqua county is in below normal precip; lower Hudson Valley is in above normal precip). The current Drought Monitor now has areas of western NY and the southern Hudson Valley and Catskills as abnormally dry, though Friday’s rain should help to alleviate this. No doubt no two years are alike and certainly 2012 is living up to the tradition. The 2012 growing season started with May temperatures in mid March and deep freezes in April. Table 1 below has Growing Degree Days (GDD) at 2 week intervals since the first corn was planted the week of April 23. Table 2 is the rainfall since April 1. The 2012 season continues with GDDs ahead and though since April 1 for the most part we are rainfall ahead, we have had weeks such as the past week where rainfall was behind. Remember corn needs about 110 GDDs from planting to germination with soybeans needing similar heat units. Right now early planted corn is in the 4-5 leaf stage. Corn should be sidedressed with nitrogen at the V6 stage. Looking ahead it should take 1250 GDDs for 96-100 RM hybrids and 1300 GDDs for 101-105 RM hybrids to reach tasseling/silking. We are starting to find Potato Leafhoppers (PLH) present in new seedings and in second cutting alfalfa. Yesterday we were in second cutting alfalfa stands 6-7 inches tall that were over threshold and should be controlled with in-secticide. Harvest is always a good control meth-od if there is enough alfalfa present to harvest. PLH will move on to fields with newer growth. New seedings should receive some special atten-tion as there always seems to be enough leaves left on the young plants that harvest does not al-ways drive the PLH away. 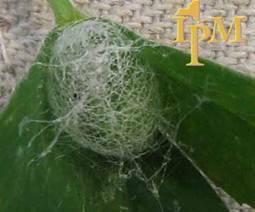 Check all regrowth, new seeding or established stands, after harvest with a sweep net for the presence of these in-sects. To determine economic thresholds use the table below from the 2012 Cornell Guide for Inte-grated Field Crop Management (http://ipmguidelines.org/FieldCrops/Chapters/CH04/CH04-10.aspx). Using a 15 inch sweep net and using 10 sweeps at 5 locations in a field determine the number the average number of PLH per sweep. Get the height of your alfalfa and look at the table above to determine if your average number of PLH per sweep is greater than the economic threshold indicated above. If it is above the threshold treatment or harvest is warranted. 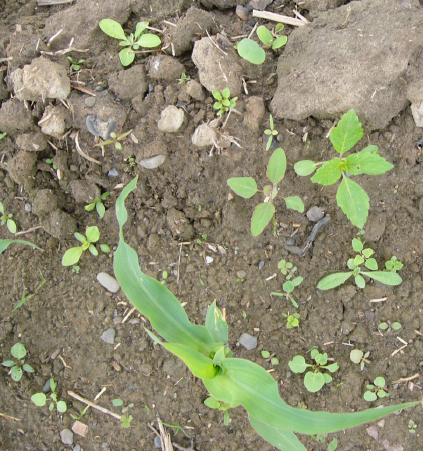 Counting on a post-emergence weed control program in corn: NOW is the time! With many things to do in the field this time of year you may be planning on a post emergence herbicide program for your corn but time has slipped by without it. Check your fields now to see if weed and corn height is appropriate for the herbicides you have se-lected. You might find given the good growing condi-tions weeds and corn have progressed faster than you would have thought. Post-emergence herbicides can provide good control of weeds but if delayed can cause yield losses from weed competition. CP Bio Energy LLC Announces Seed Discard Management Programs – for full article click here. To view the full NYS IPM Weekly Field Crops Pest Report for May 24, 2012, click here. The June 2012 Issue of the Lewis County Ag Digest is now posted online at: http://counties.cce.cornell.edu/lewis/agdigest.htm. May 23, 2012 – The Oneida County Scouting Report includes a weekly update of weather conditions including local rainfall and GDDs, and periodic comparisons with the rainfall and GDD averages from the past 20 years. It also includes current condition of field crops: corn, soybeans, hay, wheat and oats. Any potential threats from pests of these crops are reported with information from the Central New York region as well as from local fields. During the month of May samples are taken from local hay fields weekly with reports of NDF, NEL and CP are included in the report. The majority of New York’s winter wheat crop is now or soon will be flowering. This is the decision time for application of an efficacious triazole fungicide (i.e., Caramba, Prosaro, or Proline) for suppression of FHB and control of fungal diseases on flag leaves. A flowering application of triazole fungicide should be based on Fusarium head blight (FHB) risk as well as the risks of powdery mildew, rust, and fungal leaf blotches in the upper canopy based on scouting of individual fields. The FHB Risk Assessment Tool indicates low risk for FHB infection throughout the state. Forecasts for the next several days predict warm temperatures and a continuing chance of scattered thunderstorms, but not long durations of leaf wetness. Check the Risk Assessment Tool and your local weather forecast frequently during this critical window of wheat development. And be aware of the 30 days to harvest restriction for the application of triazole fungicides. Last week temperatures ranged from three to nine degrees above normal for most of the state. Precipitation amounts ranged from just a trace up to two inches. The base 50 growing degree-days ranged from 50 to 100. Today will be mostly sunny with a slight chance for showers and thunderstorms, more likely in the Catskill area. Highs will be in the upper 70’s and low 80’s. Lows will be in the upper 50’s and low 60’s. Friday we’ll have a continued chance for showers and thunderstorms as a week front passes through, with highs in the upper 70’s to mid 80’s. Overnight temperatures will be in the mid 50’s to low 60’s. Saturday will be mostly sunny with highs will be in the low to mid 80’s with lows in the upper 50s and low 60’s. Sunday will be hot and sunny with temperatures in the mid 80’s to near 90; there is a chance of showers and thunderstorms. Lows will be in the 60’s. Monday will be sunny with highs in the mid 80’s to near 90, again with a chance of showers and thunderstorms. Overnight temperatures will be throughout the 60’s. Tuesday’s temperatures will be in the low 80’s with showers. Lows will be in the 60’s. Wednesday will be cooler with highs in the 70’s and scattered showers. Lows will also be cooler with temperatures in the 50’s. The five-day precipitation amounts will range from half an inch up to 1.75 inches. The 8-14 day out look is showing normal temperatures and above normal precipitation.